Jacquard Acid Dyes produce the brightest, most brilliant colors possible for protein fibers such as silk, wool, cashmere, alpaca, feathers and nylon. Used for yarn and garment dyeing (immersion method) or for painting and printing applications (using steam setting), these colors can be mixed to produce practically any color in the spectrum! 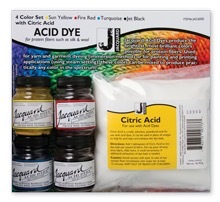 Extremely brilliant and colorfast, they are very easy to use and produce a uniform dye job. A half ounce bottle will color up to two pounds of fiber depending on the depth of shade. This set includes 1 lb. of citric acid dye fixer and four ½ oz. jars of dye powder with the following colors: 601 Sun Yellow, 618 Fire Red, 624 Turquoise and 639 Jet Black.